Should an Independent Regulatory Agency Head Be Visiting the White House This Often? Move over, health care reform, climate change, and the economy. Judging by White House visits by various government agency heads, the Obama administration instead appears preoccupied with the re-regulation of communications, media, and the Internet. The Administration has just released logs of all visitors to the White House and Executive Office Buildings from Obama’s inauguration through August—including a staggering 47 visits by Federal Communications Commission (FCC) Chairman Julius Genachowski. By contrast, no other major agency head logged more than five visits. Chairman Genachowski obviously has an audience with those at the highest levels of power, including the President himself, but this raises questions about just how “independent” this particular regulator and his agency really are. The Administration deserves credit for releasing these visitor logs, which offer unprecedented transparency into the White House’s workings. Unfortunately, the logs lack visitors’ affiliation and title, making it difficult to discern subtle patterns. Furthermore, each entry indicates only one “visitee” and the total number of people involved. Full disclosure requires identifying all meeting participants. Nonetheless, President Obama’s gesture is a great first step toward improved government accountability. This openness allows us to ask questions we couldn’t pose for previous administrations—such as why the FCC head seems to have unparalleled access to the White House. 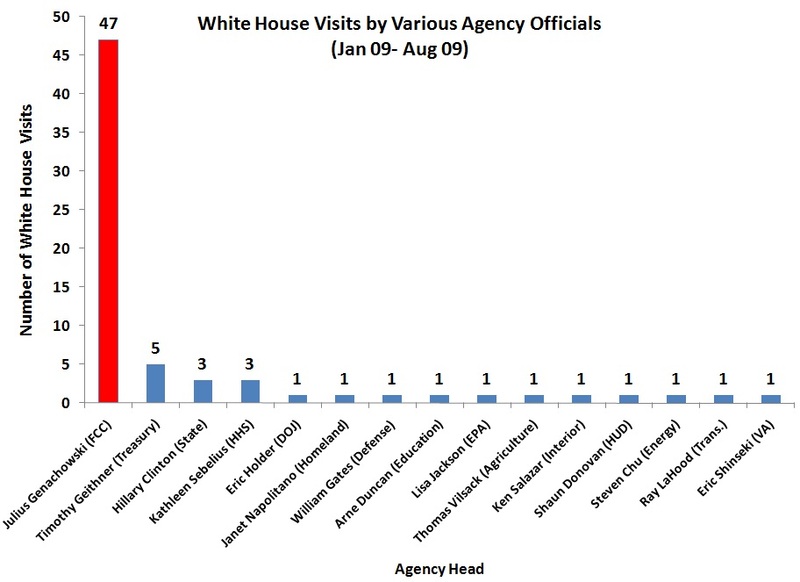 Lacking data from previous administrations, it’s difficult to make direct comparisons with previous FCC Chairmen, but the sheer number of visits by Chairman Genachowski leaves no doubt about his uniquely close involvement with the White House. Given the ongoing economic/financial crisis, you might think that the President and White House officials would be meeting regularly with the heads of other independent agencies, such as the Federal Reserve, Securities and Exchange Commission, Small Business Administration, Federal Trade Commission, Federal Deposit Insurance Corporation, and National Labor Relations Board. But not one of those agency heads appears to have logged a visit through August. Climate change? Just a single visit with the EPA Administrator. And Cabinet-level officials? Just 23 visits among 21 officials. How is that possible, you might ask? Apparently, Obama held just one full Cabinet meeting in the first seven months of his presidency (in May)—followed by a second meeting in November (well after the logs end). So, while President Obama and White House staffers were too busy to meet with Cabinet-level officials, they always made time for Chairman Genachowski. Indeed, of the 1,786 visitors listed, only two logged more visits than Genachowski: Bancorp CEO Richard Davis (56) and Lee Sachs (61), Deputy Treasury Secretary. President Obama appears as the “visitee” for two of Genachowski’s many visits, but could have met with him along with others if someone else was listed as the visitee. More telling is that only 7 of his 47 visits included more than 10 attendees, and 25 were one-on-one—meaning that the FCC Chairman usually had a personal audience or a small audience. Why all this attention for such a relatively obscure regulatory agency? Genachowski served as Obama’s Technology Advisor during the campaign, the transition, and the beginning of the administration. Eight of his 47 visits occurred before his long-anticipated nomination as FCC Chairman was announced on March 3, with 31 more before his June 29 confirmation. Only eight occurred after his confirmation, but July and August are generally Washington’s slowest months, so it will be interesting to see just how many more visits he’s racked up since August when the administration releases updated logs. Probably far more than any other independent agency head: Even his eight visits in July and August are remarkable compared to the near complete lack of visits by other agency heads. Why care? Well, at least in theory, “independent agencies” are supposed to be just that: independent. They aren’t part of any Cabinet-level department and are supposed to be insulated from direct, day-to-day political pressure through bipartisan commissions, fixed terms, and safeguards against presidential removal. At least that was always the “progressive ideal”: independent, “scientific” expert agencies and officials. Of course, it was always more mythology than reality, since bureaucratic management is rarely “scientific” and these agencies are routinely subjected to blatant political pressure from White House officials and Congress. Any history of America’s broadcast sector includes stories of political meddling at the FCC—often prompted by officials outside the agency. Nonetheless, there are good reasons for maintaining a firewall between independent agencies and politicians—especially the FCC, whose extensive media regulations give it leverage that has been used to squelch political opposition to past administrations. Interestingly, after his nomination, Chairman Genachowski met at least four times with Cass Sunstein, who now heads the Office of Information & Regulatory Policy (OIRA). While Sunstein was not confirmed until September, their meetings raise important questions, since OIRA ultimately has final sign-off on the FCC’s regulations. Have the two continued to meet since? If so, one hopes it was not to discuss Sunstein’s disturbing proposal for “electronic sidewalks” for cyberspace—a “Fairness Doctrine” for the Internet! Is This Good or Bad for the Internet? The critical issue is whether the FCC’s special relationship with the administration is beneficial for America’s dynamic digital economy. That depends on whether you like the sound of a “New Deal 2.0” because—with the exception of some genuinely laudable eGoverment/transparency initiatives and openness to real spectrum reform (to be discussed at PFF’s upcoming event with Blair Levin this Tuesday, December 2nd)—that’s generally what the administration is pushing for in communications and media policy: command-and-control central planning of high-tech, backed by massive infrastructure subsidies and the re-regulation of sectors that have thrived since deregulation. Under Genachowski, the FCC has essentially asserted jurisdiction over the entire Internet, recently inquiring about regulation of online television, video games, Google Voice, cloud computing, the Apple apps store, and resurrecting railroad-era concepts of common carriage “neutrality” in ways that could ultimately apply not only to broadband, but also to search engines, social networking, and devices. As we’ve warned, Chairman Genachowski is leading us down the road of vastly increased government meddling across cyberspace. That regulatory apparatus will inevitably be used as a tool of politics, if not by this administration, then by another less noble one in the near future—which might explain why some in this administration are so keenly interested in Chairman Genachowski’s FCC. Previous post: Search the TLF from Your Firefox Search Box! Next post: Who’s Going Mobile (on the Internet)?